Our inspirational Ultra Dune Bar Shower Valve with Slider Rail Kit - A3910 is designed with innovative technology will enhance any bathroom. For total flexibility, complete the look of your bathroom with a Modern shower kit. Modern styling with a stunning chrome finish. 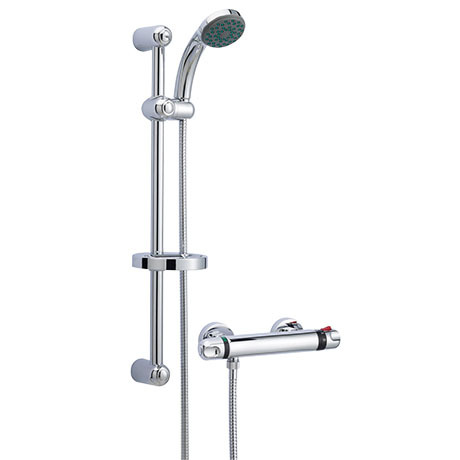 Features a pre-set maximum temperature and an automatic anti-scald device that make showering safe and convenient. The stylish design of the bat valve and slider rail kit will enhance the appearance of any modern bathroom. Shower is installed in B&B En Suite and does look the business! The valve feels solid and precise which is the important end. Head is a bit plasticky and time will be the judge. Cannot fault the value for money. If I need another one then I would buy again. Easy to ues and looks excellent. Very pleased with the shower purchased, great quality and easy to use. Was on special offer and beat other retailers by miles, but especially with the information supplied on the internet. Excellent service from start to fiinish, easy to order, very quick delivery and would not hesitate to order again.